I recently flew to Changsha (the capital of the Hunan Province in China) to attend my brother-in-law's wedding. I also visited Hong Kong for several days, and I will write about my dining experiences in that city in a later post. Our visit preceded the Chinese New Year by only one week. Oh, and clearly this post has nothing to do with vegan baking. 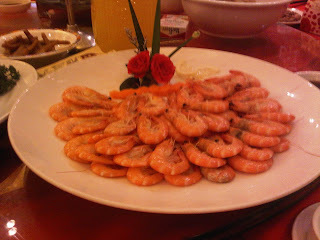 The majority of our meals in Changsha took place in banquet-type facilities (rather normal given that the meals were part of larger events, such as the rehearsal and the wedding itself) so I cannot discuss actual restaurants, but did take plenty of photos of some interesting dishes. 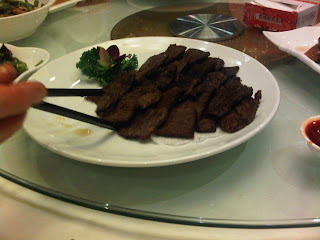 We did have a meal at the Changsha Sheraton the first night we were there, even though we were not staying in the Sheraton. We also ate at Pizza Hut, which is a little different (ahem.. extremely different) than U.S. Pizza Huts! 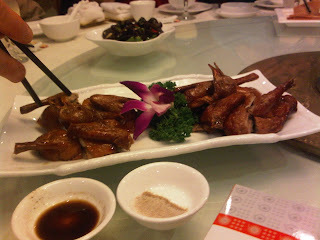 Therefore, this post will be more of a photographic tour of my dining experiences in Changsha. Our first meal, as mentioned above, was at the Sheraton at an upscale restaurant and bar named Bar Zen. 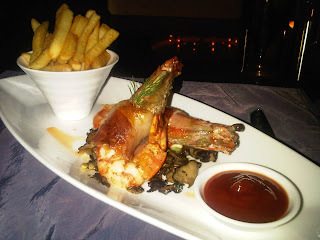 I had delicious bacon-wrapped giant prawns, and my husband had some sort of lobster pasta (not pictured). The following day consisted of meeting our translator/friend of the bride's family (a local college student preparing to further her education in the U.S.) and taking a trip to a main shopping district. 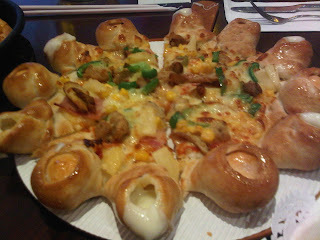 We stopped for lunch at Pizza Hut, which in Changsha is a somewhat upscale-sort of restaurant with a very extensive menu. The bride and groom even suggested we stop in for a meal, so we took their advice. 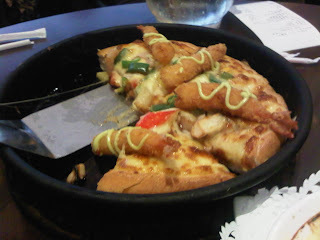 We ordered a rather odd array of dishes, from benign mashed potatoes and lychee smoothies to a fried shrimp pizza (which also had crab and octopus buried in the cheese) and a shrimp stuffed crust pizza (the stuffed knots alternated between cheese and shrimp). We then spent an hour or two walking around the shopping district, popping in and out of various stores and generally people-watching as our translator told us about cram schools and other interesting tidbits. After an afternoon of walking around the shopping district, we stopped at a bakery in the basement of a department store. Given that I know absolutely no Mandarin, I have no clue what the store is called, but the bride knew exactly which bakery we visited when I mentioned it and said it was one of her favorites. We bought several pastries in the bakery, including one shaped like a bumblebee. There was a bit of cream filling in his head and some red bean filling in his body. The remainder of our meals were family-style meals at banquet halls and to my untrained palate, tasted mostly the same (further complicated by the fact that I cannot eat spicy foods for medical reasons, and therefore was not able to try many of the dishes because I really did not feel like experiencing a Changsha emergency room). 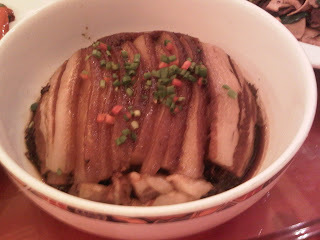 I am posting some photos of the more interesting dishes, as I am sure you don't need to see photos of steamed buns and white rice! 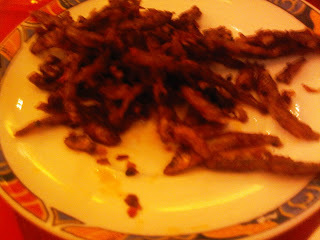 Fried baby birds -- can you spot the head and beak?